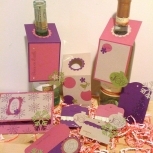 This is a very bold handmade birthday card, maybe for the daring person in your life! 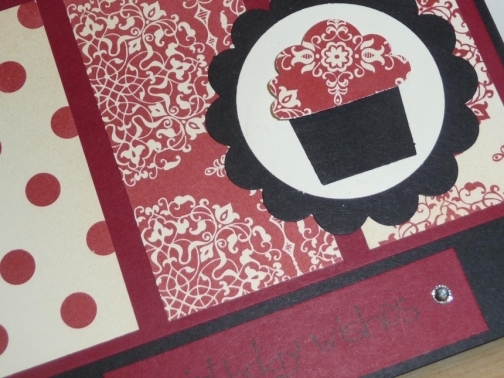 With cream, black and red patterned paper, and a bold cupcake popped on the scallop circle. Hand stamped by me and the cupcake and scallop are all craft punches that i use. Item ships from: Markham, ON, Canada. 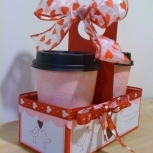 $1.50 CAD ($1.00 CAD when combined with another item) by CanadaPost. I received your parcel today! Thank you so much for great packaging. It arrived in perfect condition. 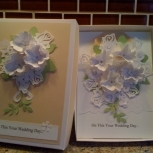 You did a fantastic job and I look forward to presenting this custom wedding card, to my daughter on her wedding day. Again, thank you very much for extra care, reflected in your work! We want you to be as happy with your purchase as we were making it. Should you run into any problems, please contact me to discuss. Returns will be honoured less shipping and Paypal charges.